This time of year the compost bin is covered with volunteer squash plants. They never grow true to seed, so I don’t do anything more with them than remove the squash blossoms and make them into a fried delicacy. 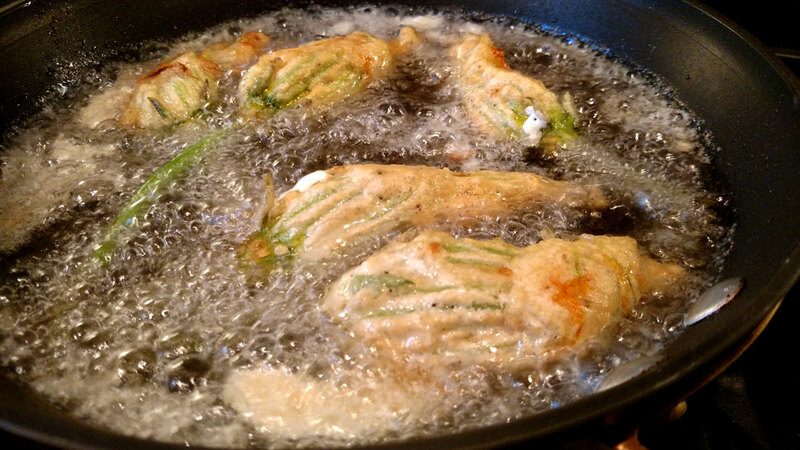 Using herbs and a light sautéing touch you too can create fried stuffed squash blossoms. or 1/2 teaspoon each, dried. 1/4 cup of corn starch - this makes a lighter coating, but you can substitute for an equal amount of flour. 1/2 cup of beer - okay to use bubbly water, like soda or sparkling. Allow cheese to reach room temperature. Chop herbs and mix into softened cheese. Cut off long stems of squash blossoms, but stop at green base. Be careful not to clip a hole in the bottom - you don't want melting cheese to leak out too much. Stuff each blossom with about a teaspoon of cheese mixture, depending on the size of each squash blossom. Combine the batter ingredients in a shallow bowl. It should be thinner than pancake batter. You are going for a light coating, it can be on the thin side. It's all about tasting the delicate blossoms. Roll the filled blossoms in the batter, coating all sides. This coating will help hold in the melting cheese/herb stuffing. Add vegetable oil to sauté pan or pot, over medium/low heat. Test heated oil in pan with a drop of batter -- it should bubble and fry. The oil is then ready to fry and you can begin. Pick up coated blossom and let excess batter drain off; then add each Stuffed Squash Blossom into pan as you coat them. 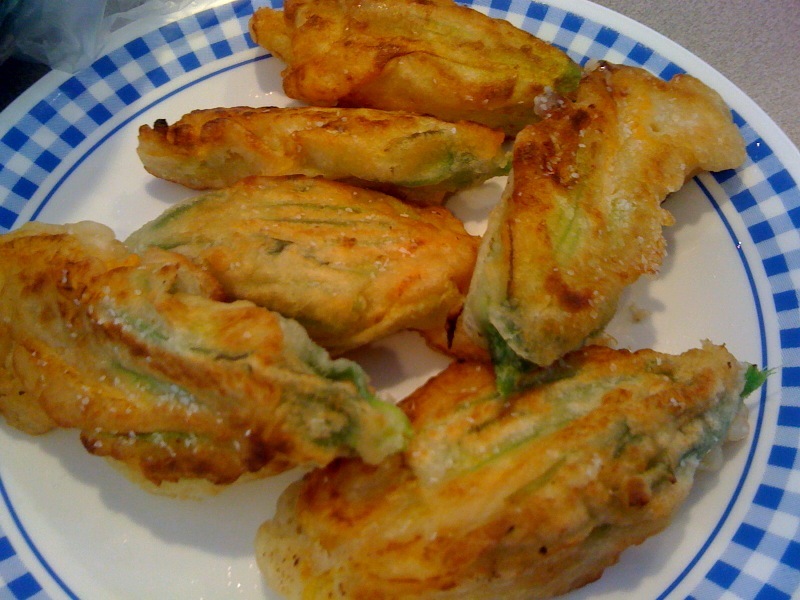 Turn over each Stuffed Squash Blossom when edges just start to lightly brown -- you don't want a dark "Fried Chicken" brown, more of a "Japanese Tempura" light color. Be careful as blossoms may sputter and splash some grease, because of the melting cheese -- that is why pan heat is medium/low. Drain on paper towels or a metal rack. Be careful of the first bite -- it will be deliciously melting hot!